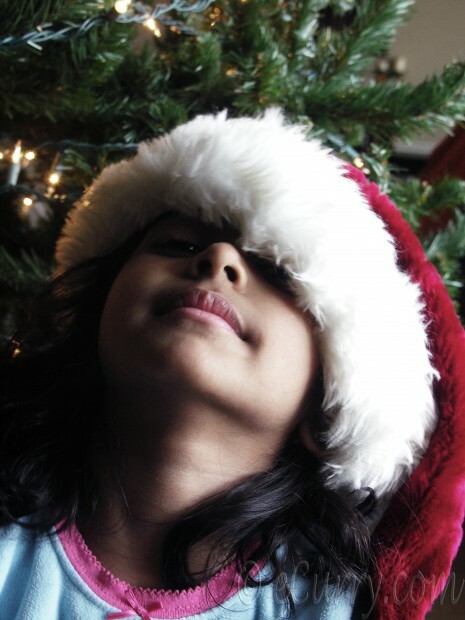 The tree is up, sparkling and decked, the excitement has begun and the little ones have started dreaming and hoping. I have one child talking, walking and sleeping Santa Claus. The sheer shimmer in their eyes and their energy uplifts my mood and gives me reason to life. It is indeed a special time. The undulating road in life continues, but the overall spirit during this time of the year makes it so much easier to see the light, to learn from the children in their undoubted faith in the magic. And the magic really starts when you start to believe! Oh! to be like a child again to have that trust and faith in ourselves and our life without doubts. While I write this, I am watching the movie “Polar Express”. 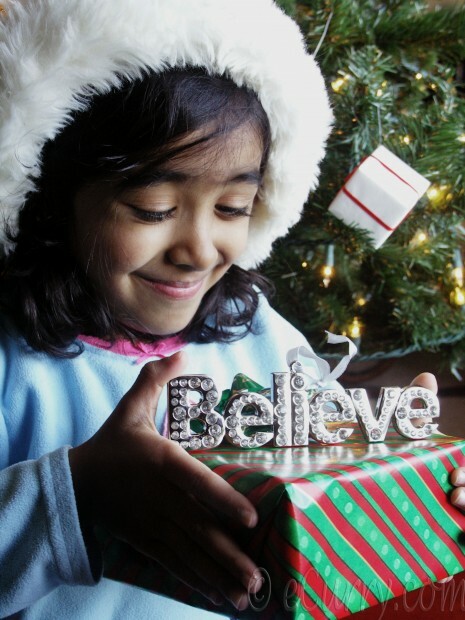 It has become a tradition in our family to see this movie during the Christmas time a numerous times, and I cannot help but share the lyrics of “Believe” . When I heard the song, I realized it was just so appropriate to what I have been trying to convey in this post. Here it is in the spirit of the season, the time of giving, of love and friendship, and of dreams and hopes. Believe! We find ourselves again on Christmas Day. Remember you can hear the bell ring only if you believe! Sending the above photo to NCR: Festive Photos, hosted by Jacqueline of Tinned Tomatoes. Paneer is fresh home-made cheese consumed in India. While the cuisines in the northern and also western states of India features paneer in curry or appetizer dishes, the use of paneer in the eastern regions is more to make desserts/sweets. ( ref. to my Sandesh post). Unlike most cheeses in the world, the making of paneer does not involve rennet as the coagulation agent, thus making it completely vegetarian. Some kind of acid, like lemon juice or vinegar or even yogurt is used to coagulate milk to make paneer. In northern regions of India, Paneer Chaat is a very popularly done. Fresh homemade cheese is drizzled with spices, salt, pepper and served with fresh veggies like bell peppers and carrots, onions and sometimes chutney. Most of the times this is eaten as a snack or an appetizer. I made this salad for lunch with the chaat in mind, but did a few things on my own with all that I love – pomegranates, sumac, chili pepper and rosemary flavored oil. You cannot go wrong with these, can you? If you do not have Paneer, use Feta or Mozzarella. This salad is like a marinated cheese with some fancy frills; pretty with a fresh, sweet and spicy taste. Paneer is bland by itself, so I would recommend that you allow it to infuse with the flavored oil or dressing for sometime. If you are using store bought paneer, cube them and plunge them in boiling salted water for a just a couple of minutes. This softens them and makes them more absorbent. I find store bought paneer too stiff and firm to enjoy them fresh. Feel free to add salad greens to this to make complete but light meal. Adapt, add, innovate and make it your own. If you are not using flavored oil, combine olive oil, salt, pepper and any kind of herb you want to use and whisk them together. Cube the paneer. If you are using store bought paneer, sprinkle the cubes with water and herbs if you wish and pour some boiling hot water over the cubes, just enough to cover the paneer. 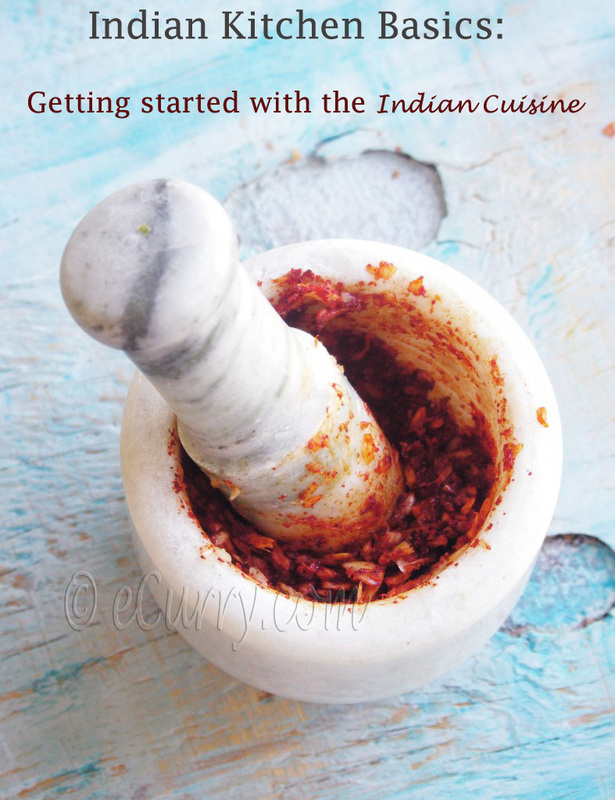 This softens the paneer, as well as salts and flavors them. After about 10 minutes drain the cubes. Drizzle the flavored oil/dressing on the paneer and let it sit for at least half an hour at room temperature or overnight in the refrigerator. You can make the salad instantly, but it tastes better if the cheese is infused with the oil. Place the paneer in the dish. Add the toasted cashews, pomegranates, thinly sliced chili peppers (if you are using them) and scallion. Drizzle some more flavored oil and gently toss. Sprinkle sumac and red chili powder/or paprika. Add the finely chopped fresh cilantro and serve at room temperature. Simple, light and bright – a quick, easy, healthy and a scrumptious treat. 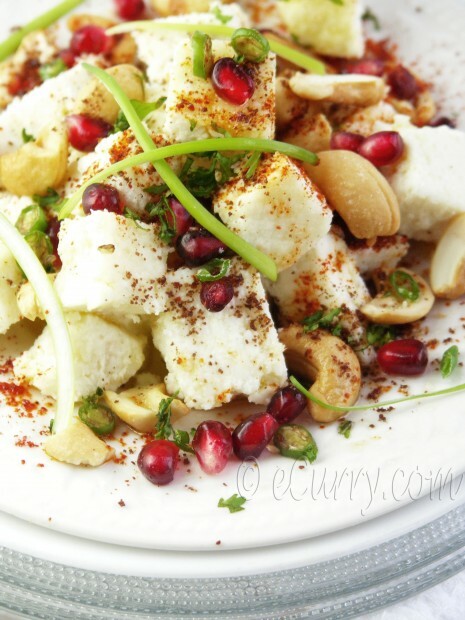 That festive paneer dish is amazing! So beautiful and delightful. Aah just the colors of Christmas on that plate. Looks beautiful. There is really no excuse for using store bought paneer! 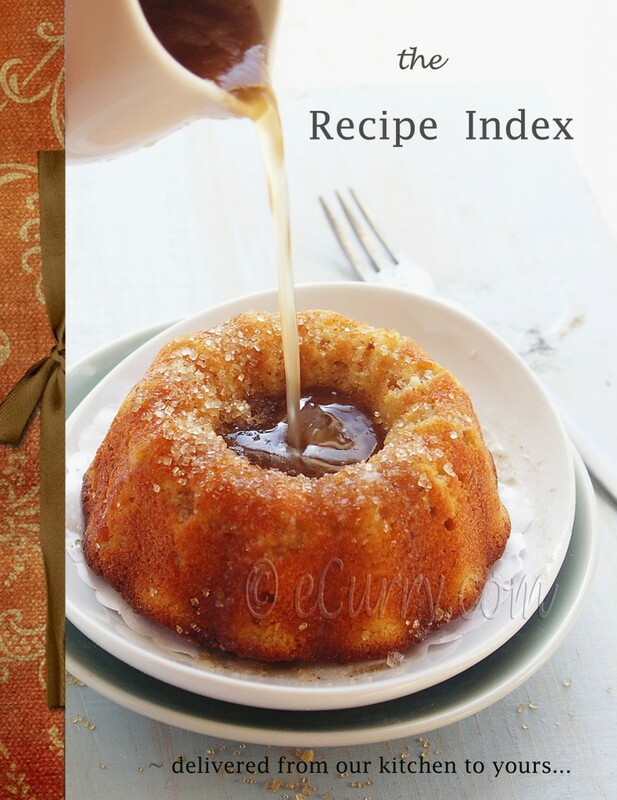 It is so easy to make and the taste and texture difference is immense. Greetings and Best Wishes for the season! The dish look so tempting even though I am not a paneer fan. Tomar meye duto ki mishti Soma, ar ki jhakjhake hasi…thats a beautiful poem.thanks for sharing aar paneer er dishta khub bhalo. amader bondhu ak packer sumac ene dieche…eta akbar try kore dekhbo. Wow, that looks amazing! Beautiful dish! A beautiful dish for Christmas and a yummy one too. Merry Christmas to you and your family. Wow, what an amazing combination. Making paneer is so easy I want to go and make some right now. The colours are beautiful and the combination of flavours sounds awesome: a perfect paneer! It indeed is a very colorful and easy recipe to make. Love the anardanas in it. Love the pictures of festive decoration. Oh Soma, that looks utterly fantastic!! I love the colours and you are right – so festive! 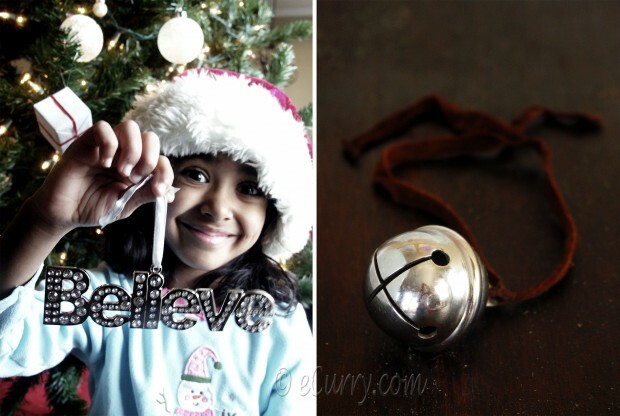 Thanks for sharing – love the “believe” decoration and the pics. This salad looks scrumptious ! and what a lovely girl you have ! That is a warm post – love the Believe poem. The dish got a festive touch! Looks fantastic & I believe the taste is great too! I would love to try that cheese! 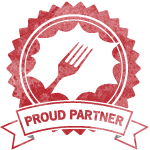 Hi Soma, I have been following the vegetarian recipes on your website (I am a vegetarian :)) and I think you do a great job. 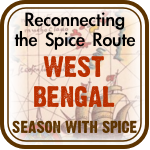 I started blogging today and plan to use it for sharing recipes. I would love to hear any comments from you. 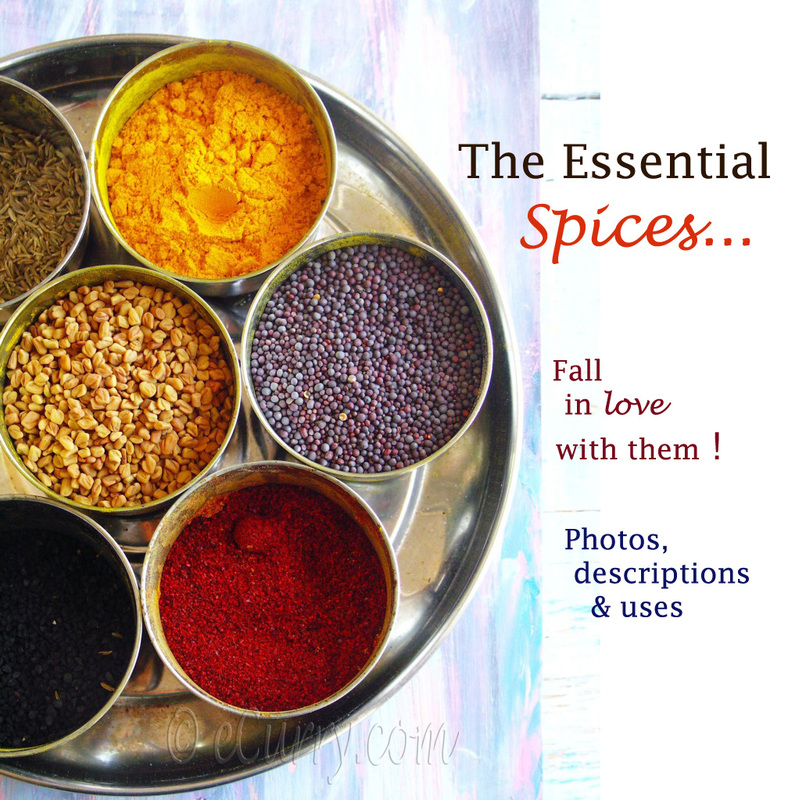 Check it out here – http://cookitupwithshwets.blogspot.com. Thanks! 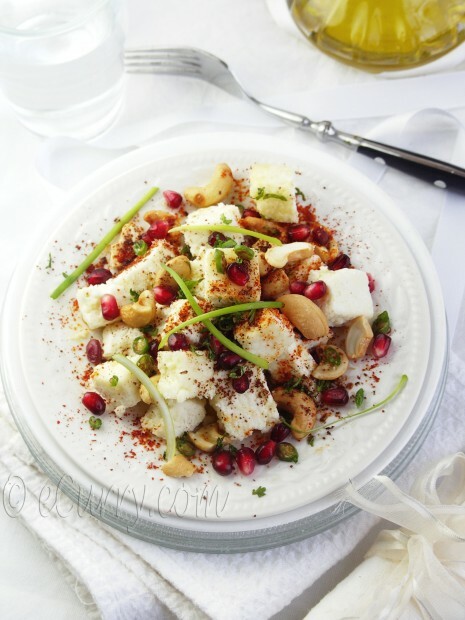 Soma, I love paneer, and this is a great way to serve it, so pretty with the pomegranate and sumac…great dish for the holidays. “Believe” is indeed a magical word. It can make our dreams come true. I really wish I can make something fresh and refreshing for my lunch meal. Grr…I should have a facility to work from home.. This is such a new way to eat paneer to me. Though I like the creamy dishes, I think this would be a wonderfully refreshing change of pace. The bright and tangy flavors in this sound so good. And, of course, the colors are lovely. Happy Holidays to you! Such a lovely post, love the colours and pix. What an interesting combination. 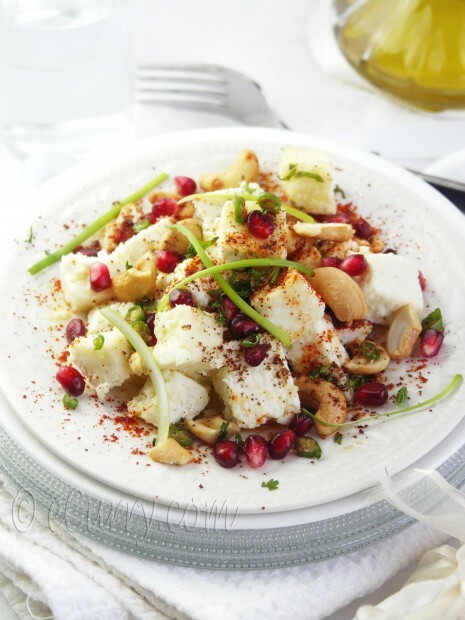 What are the chances that someone would have made a dish like this in an area where paneer is traditionally made — can you find pomegranate and sumac in northern India? Pomegranates are grown in plenty in India. However we do not find sumac. 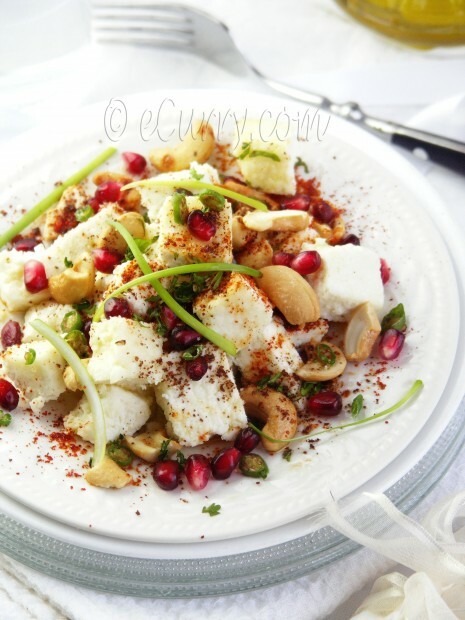 The paneer chaat which is usually made is north India has a sprinkle of Chaat Masala, which has other spices along with Amchur (dried mango powder); the amchur is very close to the taste of sumac. It is slightly tart, but the lemony flavor of the sumac is not there in amchur. We also have anardana (dried pom seeds ground into a powder) which may be used to. personally I like Sumac over Amchur and Anardana powder 🙂 the flavor, color and the tart is just right, and I prefer to use sumac as I do not always like the strong spices in chaat masala esp. for a mild dish like this. again it is a personal choice. Beautiful pictures and a wonderful site! Love your recipes. Thanks for your response, Soma. 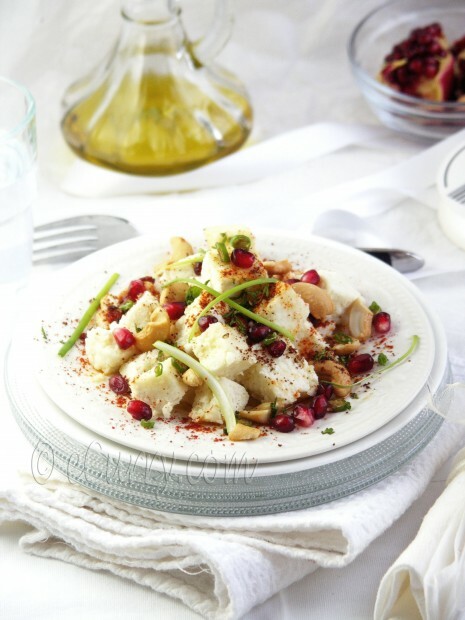 This recipe particularly caught my attention because sumac and pomegranate are local ingredients here in the Levant. It’s always interesting to learn how these things overlap.